He might not look the part, but a feisty club pro Damien McGrane has what it takes to join the big boys on Tour. After winning the Irish PGA Order of Merit for the third time in five years last term, it was no surprise that he captured the imagination of Irish golf fans at last weekend's Volvo PGA championship. Not even a disappointing final round of 79 could dampen the spirits of this stocky little 30 year-old. Despite dropping from six under par and tied with Ernie Els entering the final round to eventually share 59th place, McGrane could sit proudly alongside six-time Major winner Nick Faldo at the presentation ceremony, where he picked up a prize as the leading PGA professional. Now the Meath man is set to use his great showing around the Burma Road course as a springboard to success in the big league next year. And don't be surprised if he does it. "I'm absolutely delighted with the week," he said. "I went with the intention of playing four rounds for the first time and I did just that, which made it interesting for me. "But my big goal this year is the Challenge Tour and I want to concentrate on that." McGrane regarded the Volvo PGA outing as more of a hindrance than a help, as it prevented him from earning vital Order of Merit points at the Challenge Tour event in France. But as Irish Order of Merit winner he was qualified to play and he made the very best of the opportunity earning a handy £7,000 towards his expenses on the 'B' circuit this year. The Wexford man must finish in the top 15 of golf's 'second division' this season to earn a European Tour card for next year. After banking money in two of his three outing so far, the signs are looking good and McGrane is determined to grab his chance, despite having to juggle with his commitments as a club pro. "I haven't committed myself to a full schedule on the Challenge Tour. I'm not the kind of guy that can play week in week out but I'm hopeful I can get a couple of big finishes and get my card at the end of the year," he said on his return for Wentworth. "Guys who play every week don't usually do all that well and you just have to set your own routine and stick to it." Now the club pro at Wexford, McGrane won the Irish Order of Merit title in 1996, 1998 and again last year. He also finished third in the UK-based MasterCard Order of Merit ­ winning one event ­ and played his way onto the Great Britain and Ireland PGA Cup side for the match with the USA at Celtic Manor last September. The Americans won by a single point but the event gave McGrane even more belief in his ability to make it at the highest level. At the European Tour Qualifying School in Spain, he finished 19 under to win his section and make the six round final at San Roque. "I played steadily in San Roque but missed out by three shots in the end," he recalls. "But I got a Challenge Tour Card for this season and that's given me a great chance to play competitive golf in 72-hole events, which is what you need to do regularly if you want to get on the European Tour." "I would say that most Irish club professionals are out of their depth playing in tour events," he admitted. "The main difference between club pros and the touring professionals is that the touring professionals are geared towards playing golf six times a week, every week, on tough courses. "Pro-ams just can't compare with that. We might play one or two competitive rounds per week in Ireland and if you make a couple of mistakes you can forget it." After winning the Irish Boys title in 1987 and various youths championships, McGrane got down to scratch and turned professional at the age of 20. An assistant to former tour pro Joey Purcell at Portmarnock in his early years, McGrane moved first to Headfort before taking over as the club pro at Wexford Golf Club in 1997. But he still remembers the influence Purcell had on him as a youngster at Kells golf club. "If it wasn't for Joey I wouldn't be doing what I'm doing now," he said. "He taught me how to play the game. "All I need now is the opportunity to play more 72 hole tournaments." Judging my his performance at Wentworth, McGrane will have more chances to shine. Tour player Damien McGrane will have to watch out for a new rival in the family - his teenage brother Mícheál. “Little Mac” Damien McGrane says his new found fame won’t change him as a golfer. WEXFORD GOLF Club afforded European Tour winner Damien McGrane the ultimate accolade last week when he received honorary life membership of the club. 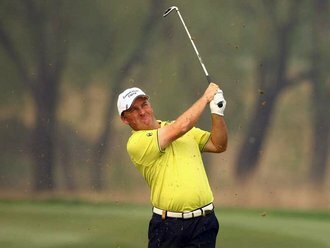 McGrane, who was the club professional from 1997 to 2004, won his first European Tour event the China Open last April.